The mydlink Home Smart Plug is a multi-purpose, compact and easy-to-use smart home device that allows you to monitor and control your home's electronic appliances from anywhere. With the mydlink Home app, you can turn appliances on or off, monitor energy usage of connected appliances, create on/off schedules and set up alerts. 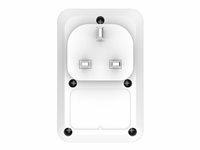 The Smart Plug's thermal sensor will even help prevent the plug from overheating. What's more, it works with other mydlink Home smart devices to enable you to create a smart home without complicated setup, installation cost or monthly subscription charges.